Hong Kong seems like it's a city for young people, but the older folks are the cool cats today. In particular 93-year-old Cheung Suet-ling, who won gold yesterday in the World Masters Athletics Championships in Daegu, South Korea. She competed in the 60-metre-event -- in the under-90 category. Although she finished third in a time of 25.73 seconds, she was awarded gold because she was the only competitor in her age group. Christa Bortignon of Canada, 80, won the race in 10.56 seconds. Cheung thought she could have done better. "I did 25.73 seconds in Daegu which is far from ideal since I clocked 37.29 seconds in the 100 metres in 2016," she said. "It's partly because I had problems with my back before coming to South Korea and I'm not used to the weather in Daegu. In fact I almost fell down during the competition which was a worry for my teammates. "Many young runners have said they wanted to learn from me since I can still run at such an age. I have an open mind when it comes to taking part in running competition. "I also want to encourage more old runners to come out of their world and enjoy sports." Hong Kong Amateur Athletics Association senior vice-chairman Simon Yeung Sai-mo said it was the first time the city won gold in an indoor masters world event, even though Hong Kong has won gold before in an outdoor masters world event. Cheung is a retired nurse and took up the sport because her daughter, Lai Yin-mei, is a runner as well. 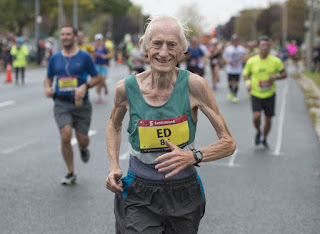 She reminds me of Ed Whitlock, who broke three hours in the marathon in his 70s and was the oldest person to run 42 kilometres in under four hours. Sadly he just died over a week ago at 86. What's amusing about the Canadian is that he had no particular regime or diet, and ran more for attention than for his health. Nevertheless, both he and Cheung show us that elderly people are capable of being really fit at their age, and why not? I hope to keep going too in my old age. I don't know if I'll be running in my 80s if I get there, but definitely swimming!